I’ve had some comments about my header picture, in particular the bed in the garden. Since I’ve never done a before and after post about this bed, I decided I’d better just do it! I found this little vintage bed at a garage sale last Spring. The $5.00 pricetag made it too good to pass up! Do people really know what they’re giving away? I think not. When I began browsing through my pictures I saw that on the same day that I set up my bed to take “after” pictures, I also took a ton of pictures of the flowers in my garden. Looking outside at my barren winter garden it is hard to believe it was so colorful last year. Before I get to the pics of the bed, allow me to detour a bit and take you on a full color tour of my garden last summer. Hopefully you’ll catch a glimpse of Spring, warmer weather and sunshine. We long for sunshine here in the PacNW. Hence, the jumbo sized bottles of VitD and the Happy Light Deluxe Energy Lamp by the bedside! How was it? Did it make you want to start planting? Still too cold here . . . but I digress. On to the “after” pics of my Frenchy bed. Painted in Annie Sloan Pure White Chalk Paint, trimmed in Duck Egg Blue, antiqued with a little silver Rub ‘N Buf, and then sealed with ASCP Soft Wax. Here is a peek at a leg first . . . Here is the headboard with a wood applique’ I purchased online and applied with wood glue. White paint, followed by blue, then distressed and sealed. 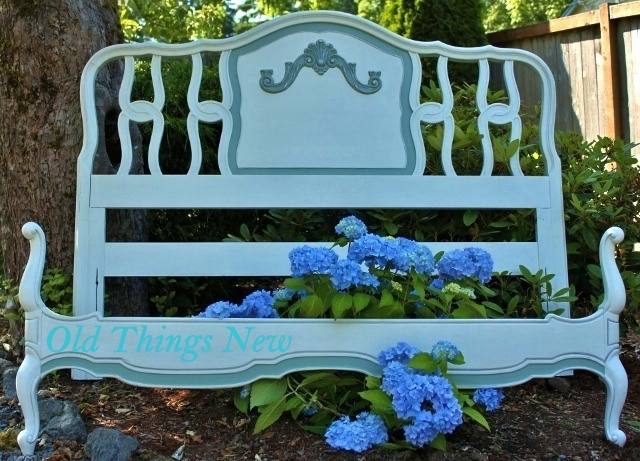 And here is a picture of the headboard and footboard together in my garden. It looked so nice set among the flowers. Of course I didn’t leave it there. Off to the “store” in my garage it went, along with all of the other furniture I am getting together to begin selling . . . somehow . . . Etsy? Craigslist? I’m still trying to figure that out and I’m certainly open to suggestions from those of you who’ve had some some experience selling their furniture. So that was one of the first pieces I ever painted using Chalk Paint and I loved it so much it ended up in my header, along with my New Picture Frames post, my paint and brushes display and my Old Things New Button . . . which, by the way, you can grab on my sidebar! I hope you all enjoyed a little stroll through my garden. P.S. In case you are interested I did a review of Three Homemade Chalk Paint Recipes in a previous post. I love ASCP but I also love making my own chalk paint from time to time. It has been fun to play around with the huge selection of colors available at my local paint supply store. « Inspired in Seattle Part 3! Great job! Looks beautiful! I’m a new follower and would be happy if you follow back! Love your garden!! My bulbs are already coming up here in Vancouver!!! What a steal on the bed!! You did a great job!! Spring is coming real soon. Your bed turned out lovely – I just recently played around with chalk paint and it is quite interesting. Your garden is magnificent – I really enjoyed looking at your photos. Hope you can stop by the enchanted oven to say hi. Oh, how I would love to find such a steal of a deal… jealous!! LOL So glad you snagged it as you knew exactly how to get it to gleam again. I, too, love AS paint and especially the wax. It goes on like butta!, doesn’t it! I wish I could offer some suggestions for selling but I have yet to get into that. You will so successful with your eye for things! Good luck! Your “Flower Bed” is beautiful. thank you for taking us on a tour of your garden. It was a bright spot on this cold winter day. Wow what a deal/steal! Love the bed makeover and your garden is stunning. Can’t wait till full on spring is here. Thanks for sharing, visting from BNOP. How pretty! Love the bed color, and all the flowers makes me ready for spring. I hope you’ll drop by to see My Daughter’s Master Bath Redo – #83 at Met Monday. I can’t believe somebody sold the beauty for five dollars! Of course you made it look 100 times better…just shows what your talent can do. The flower pics are gorgeous…come on spring! Beautiful post. I am sitting here freezing and come across those beautiful photos of your garden in summer – it warmed me right up. Thanks for sharing the bed with us. You did a great job on the bed. I love it! and… the flowers are beautiful too! Please us at the Nest. What a beautiful flower bed. I’ll be featuring you tomorrow at Simple & Sweet Fridays. The bed looks so pretty in your garden. Love the colors you chose. Your flowers from last summer are so beautiful. It reminds me that Spring is just around the corner. Love the update. Please share your project at http://www.creativecraftsthursday.blogspot.com each and every week and check out what other creative divas are up to. Beautiful! Love all of your garden flowers, makes me ready for Spring and all of my garden flowers! The bed looks beautiful. Glad you shared. Visiting from Rooted in Thyme:OscarNight party. The bed turned out beautiful. Thanks so much for sharing at Transformed Tuesday. Patti, gardening is my first love (next to family and God) of course. Your beautiful flowers brightened my day. The bed is really cute. Can’t believe you got it for only $5. Thanks for sharing with SYC. What a very fantastic color! It’s a very pretty and subtle shade of blue. I hope that you took a photo of the bed inside your room too. I want to see how it works with everything else inside the room. Although, that shade of blue is very subtle, I think that it’ll work with other subtle colors as well.